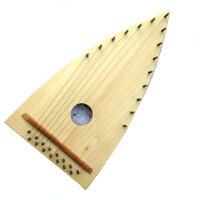 Broader and shorter in length than the usual Chromatic Bowed Psaltery, with its distinctive Gothic shape, the Diatonic Bowed Psaltery was designed to be a more Harmonious musical instrument, like an Irish harp. The strings are arranged in a fan pattern, this was to make the bowing a little more fluid with the geometry of the human arm. Tuned to a white note scale rather like the old Irish harp, the instrument resonates sympathetically as different combinations are played. 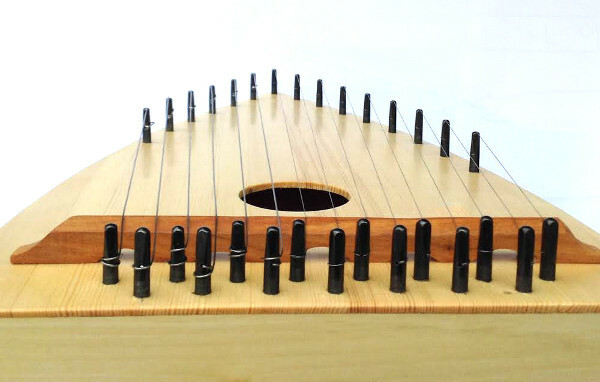 As well as being a bowed instrument, this psaltery, like its medieval ancestor, responds well to plucking and also hammering. 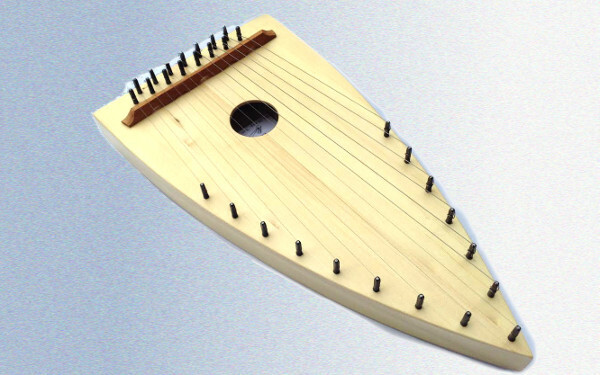 ( see playing notes ) This instrument is suitable for much folk, sacred and early music. The tuning Diatonic in the key of D is : D E F# G A B( bass side) and C# d e f# g a b c# d" (Treble) I have made these also in the key of G, C and F.
I designed this instrument in the early 1990's, initially to play Scottish pipe music and to get a more harmonic sound like the Irish harps I had started making but soon saw the potential as a folk instrument and changed the key to D.
The instrument was recently re-scaled and improvements made to the design including the use of plain steel treble strings, Viola bass strings, This means the D model no longer fits into a briefcase for travel but I build a case to fit and it still is a compact instrument for its pitch. 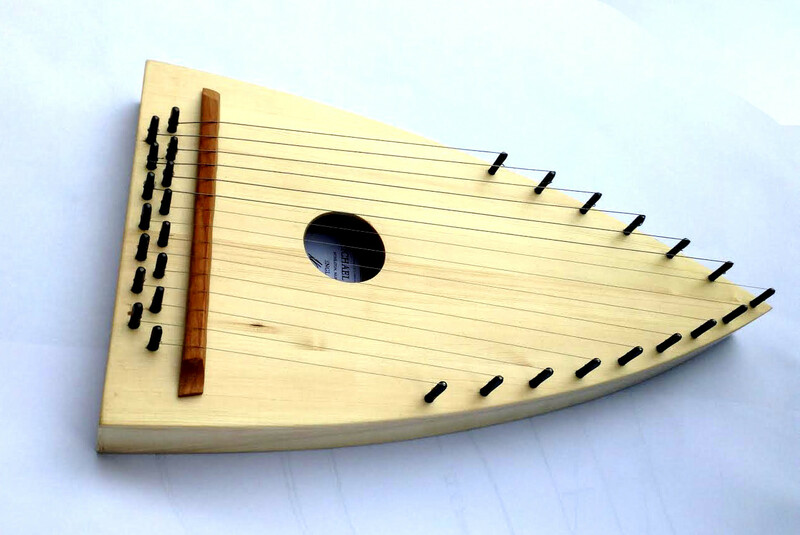 "The psaltery arrived today and is BEAUTIFUL. Thank you so much! It is amazingly resonant and I love the little harmonics it leaves hanging in the air at the end of a note. The curved edges really make a difference in how naturally you can move from note to note, in an arc rather than a straight line, and it's really lightweight and comfortable to hold. What a great design. It's beautifully made and the tulip wood is unusual and beautiful, with a grain/colour unlike any other instrument I've got. I'm absolutely thrilled with it, thank you!" Rebsie Fairholm UK . I always use Hard maple for the Tuning pin block at the bottom for problem free tuning. easy to play and beautifully toned instrument! Copyright © 2018 Michael J King / Design by Andreas Viklund.